Last week I came across this fun video, which caused me to reflect once again on the potential problems of groups and group work, both on and offline. For me it’s interesting that the intention of this video is to promote group work and group behaviours in a fun and humorous way, but it also, for me, suggests at least three problems with group work. First I noted that all members of the group look very much alike, almost like clones of each other. Diversity is in short supply. Then group members have a tendency to all act in unison and to be defensive. There is the assumption, by group members, that if you are not in the group, then you are either in danger of getting lost (a somewhat patronizing assumption) or subject to the malevolence of a predator. In the light of this assumption, a common action of groups is to close ranks. All this of course, leads very easily to group think, which in turn constrains autonomy. It’s not that there isn’t a place for groups and group work – simply that groups need to be very self-aware of these common behaviours, pros and cons. I often return to Stephen Downes’ post on Groups vs Networks: The Class Struggle Continues and this diagram that he drew. In the last year or so, I have seen more and more open online courses introduce group work or collaborative projects, or promote learning in spaces that encourage group formation, which is a departure from the initial intention of massive open online courses to promote networking. Is it time to remind ourselves of the potential hazards of groups and group work and consider carefully what is to be gained and what is to be lost by becoming a member of a group or embarking on group work, or by asking our students to engage in group work? Interesting questions, Jenny! I often invite students/learners to choose the ways that they’d like to work on particular tasks or assignments, i.e. alone, in pairs, or in groups. And I invite them to select their own groups, rather than selecting these for them. In offering as much choice as possible, learners can choose a way of working which suits not only their own strengths and preferences, at that particular time, but the project they will be working on. Perhaps they join the course with a personal project in mind — why be forced to join a group, just for the sake of it, when it would be more productive to work individually? Conversely, if someone joins a course to meet and work with new people, they can choose to do this. As for groups vs. networks, collaboration vs. cooperation… I think there is a “sweet spot” which involves both — but choice is essential. Harold Jarche writes about this very well, e.g. 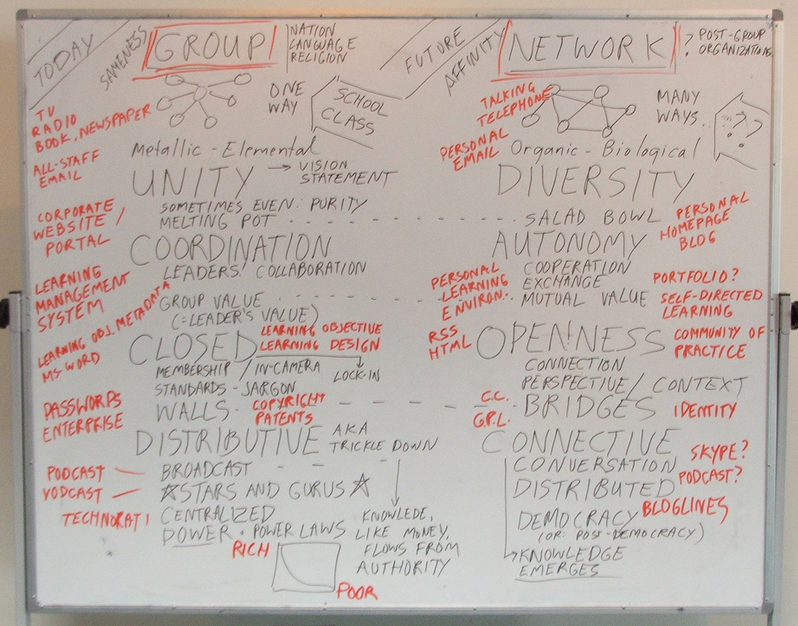 http://www.jarche.com/2012/06/in-networks-cooperation-trumps-collaboration/. In courses which I have taught and facilitated, I’ve found that group work and collaboration can be a way of emboldening learners to “jump into” bigger networks. Networking is powerful in so many ways, but as experienced networkers we may forget how scary it can be for learners to begin to engage in new networks — how to engage? what to share? how to share? who to share with? who to share as? Group work can be a useful way of helping learners to develop the skills and confidence to reach out and engage with wider networks, maximizing the benefits of both collaboration and cooperation — but only if participants have choice and agency about how groups and group work are managed. Hi Catherine – thanks so much for taking time to read this post and for your comment. In writing this post I deliberately made it short and wrote it in a way that I hoped would be open to interpretation. I could have written much more explicitly about my experience in groups and networks and cited examples, but then that would be just my experience. I am not anti-group and in fact spend a lot of time working in small research groups. Neither am I anti-collaboration. Effective collaboration is essential in my research groups. My experience of both group work and collaboration has mostly been positive, but when it is bad, it is very, very bad :-), so like you, I would always give students the choice. I also agree that we need both collaboration and cooperation. I’m not sure that I agree with Harold Jarche that cooperation trumps collaboration. I think it depends on the context and the purpose. But for me a group fails when it becomes inward looking, subject to group think and fails to keep an open mind. I think this can creep up on groups as they become so comfortable with each other that they see alternative perspectives as some sort of a threat. This is an aspect of groups that I would want to warn my students about. Hi Jenny – thanks for leaving the door open for conversation 🙂 It’s been interesting to “think out loud” here, at least a bit, re: groups and networks, an awareness of which is very important in my work re: digital identity, as well as in my teaching. You make a great point about warning students about these pitfalls as well as the benefits of groups – so important. Re: your last paragraph, I agree. This is one of the reasons I feel strongly that group work should be voluntary rather than compulsory. It is simply that — a matter of respecting differences. You note that you work in many different groups, as many of us do. We also often choose whether or not to work in groups. For example, in writing, research, project organisation, teaching, and so many other ways, I make decisions about whether to work alone or with others. It’s useful for students to practice making those decisions too. Depending on the contexts they work in, they may not always have the opportunity to make those choices, but they will hopefully have autonomy in some cases at least. In http://psycnet.apa.org/?&fa=main.doiLanding&doi=10.1037/0022-3514.53.3.497 This is paid access, so I did read the short version on https://en.wikipedia.org/wiki/Brainstorming (#challenges to effective brainstorming). A discussion about the failure of groups to generate ideas with some interesting ideas about negative factors in group work. Hi Catherine – Yes – thank you for keeping this conversation open 🙂 It seems to me that we are identifying two types of risk here. 1) The risk of not learning about the benefits of working in groups or collaborative working, by refusing to engage in this way and 2) the risk of ending up in an inward looking closed group that is unaware of alternative perspectives. These risks lead to having to make difficult decisions. >>> As for the risk of groups become inward looking, this describes a good number of the organisations and institutions I’ve been a part of or interacted with over the years! …”seeing alternate perspectives as some sort of threat”. Do you think the rise of networked research and networked professionalism will serve to counteract this? Or perhaps the comfort of similar perspectives will tend towards creating our own filter bubbles? Your question about the power of networking to counteract inward looking thinking has been on my mind recently. Last week I went to a day conference about Arts and Humanities MOOCs which pretty much convinced me that MOOCs are becoming more and more inward looking. These are the Future Learn, Coursera, opening up your existing online course type of MOOCs. Whilst these MOOCs seem to be doing a good job in terms of our existing understanding of what makes for good ‘distance or online learning’, it seems to me that they promote group thinking as opposed to the networked thinking promoted by the initial cMOOCs. So, I see consolidation of existing thinking, i.e. how can we accommodate MOOCs into what we already do, rather than asking the question, ‘how can we be innovative in our thinking about teaching and learning’. Hope this makes sense. Thanks for your comment. Likewise individual work fails when it lacks self reflection and becomes solely inward looking. So the lesson I take away is — reflection + diversity. Jaap – many thanks for the link to the paper, which I have managed to track down in our local University library. Very helpful – thanks. Nancy – thanks for your comment. Yes ‘reflection + diversity’ for groups and individuals. Interestingly the paper recommended by Jaap doesn’t dismiss working individually and discusses both the pros and cons of working in groups, but in particular discusses what can block effective group work. The advantages of diversity in groups are lost when the group becomes subject to group think.